The day of my last post from last week, I checked out Barnes and Noble, looking for the latest issue of Writer’s Digest magazine. It began with a quote from Stephen King, which said if you didn’t have the time to spend reading, don’t bother picking up your computer or pen to start writing a story. You read what you love and write about that certain genre, hoping you’ll be successful. 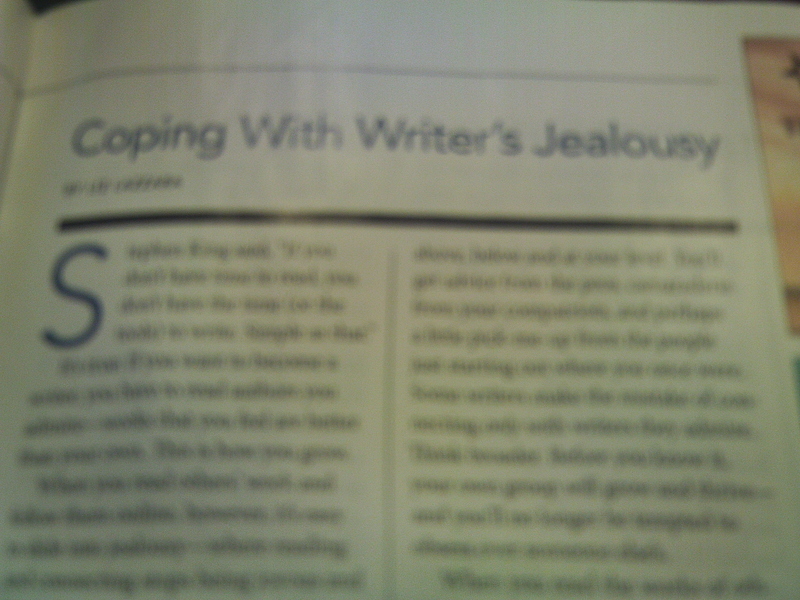 But then it says, reading is all good fun until you easily slip into jealousy. Those three statements are slightly true. I want their 50th birthday celebrations, their long lists of books they have in print, and their talent. Steven Moffat has an impure talent for the Doctor Who episodes such as “Deep Breath” or “The Magician’s Apprentice”. Neil Gaiman could cause a riot with Trigger Warning from what I understand of it (I will read some of it soon), and J.K. Rowling captivated me with her stories about a little wizard who was my age back when I was going to middle school. I grew up with the Harry Potter books. And those who are lucky enough to know those souls, I want to be around them. But it’s as if I could never get close enough. It’s just like my first Fall Out Boy concert I ever went to: a bunch of excited girls jumped up and down and started running to get more autographs, and I ran after them, only to be stopped by my own breath and my cell phone, my dad paging me to come home. Safe to say, I didn’t get any autographs or souvenirs that night. It fell down as one of the worst and best nights ever, though my favorite rock concert memories came from when the Recher Theatre was still around, playing small rock gigs until midnight. Now that it’s a seedy nigh club, I’m home all of the time, thinking, where did all the time go? This is why I gave up on being a rock and roll journalist a long time ago. Rock and roll is dying out, and hip hop and pop music won’t stop growing, which makes me sick. It’s almost as if a part of me is dead. As you may have guessed, I can’t get enough of Sara Bareilles’s book Sounds Like Me: My Life So Far In Song. She’s been through a lot: divorced parents, her first heartbreaking time in Italy, condescending songwriter after songwriter, three albums, judging on The Sing-Off with Ben Folds, and now, making a Broadway musical. This woman needs a Tony award and a Grammy sometime soon, because she’s been through so much as a struggling singer in her early days. She also has a hard time with her body image, thinking that she’s “fat”. I empathize with her since I’m 140 pounds and I still think I should be as skinny as a ballerina or those girls who usually audition for dance recitals or community theatre. I’ve always been jealous of them. And in every letter, she says, “You are beautiful.” This captivated me on a level that promotes the power of positive thinking. Though the quickest way to my heart is with a good book and some chocolate to go with it. Nope, I’m still going to write. Writing helps me cope. There used to be a girl who was kind and had a messy bedroom. She’s one of the most loneliest girls in Baltimore, but she would find a way to have fun anyway. She strode to be perfect, but wasn’t perfect, and she got her heart broken so many times when she was in school, but she made it without help. She would never give up hope. This entry was posted in Authors, Blog, Careers, College Life, Fiction, Inspiration, Literature, Mental Health, NaNoWriMo, Nerd, Post Grad, Reading, Science Fiction, Writing, Writing Therapy and tagged Camp NaNoWriMo, CampNaNoWriMo April, Lady in the Blue Box, NaNoWriMo April, National Novel Writing Month, Rachel Ahrens on NaNoWriMo, Rachel Beth Ahrens, rachel beth ahrens fiction and more, Rachel Beth Ahrens's new novel, rachel beth errands, rachelbethahrens, Sara Bareilles, Sara Bareilles review, Sara Bareilles Sounds Like Me, Sara Bareilles Waitress musical, The Nerd Queen. Bookmark the permalink. « The Doctor is In: Miss Pond, DON’T PANIC!